Keith J. Bybee, the Paul E. and the Hon. Joanne F. Alper ’72 Judiciary Studies Professor, College of Law; Professor of Political Science, Maxwell School of Citizenship and Public Affairs; and Director, Institute for the Study of the Judiciary, Politics, and the Media, comments on President Trump’s ”So-called Judge” Tweet regarding Federal District Court Judge James Robart’s ruling on the Executive Order on immigration. The DC Externship Program had the opportunity to hear from Distinguished Guest Lecturer Mickey Martinez at the Department of Justice within the Office of Foreign Litigation. 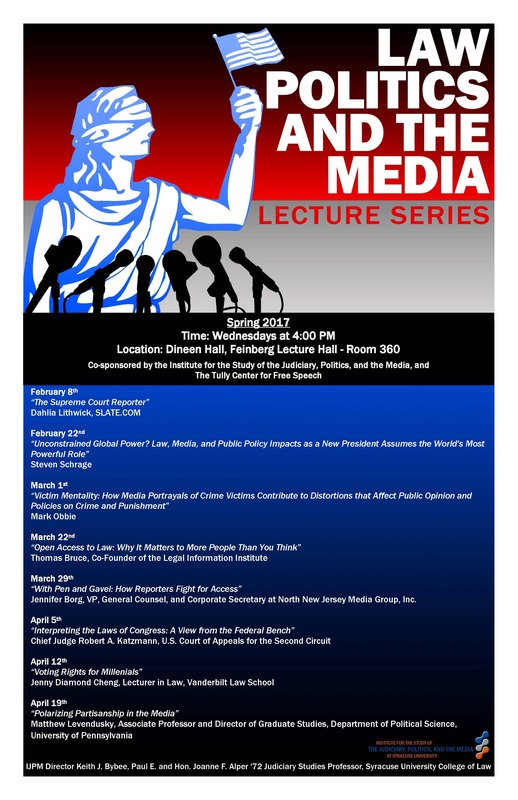 The annual Law, Politics and the Media Lecture Series will begin February 8th with guest lecturer Dahlia Lithwick, Supreme Court correspondent and host of the Amicus podcast for Slate.com. Crandall Melvin Professor of Law Shubha Ghosh recently spoke with the Binghamton Press & Sun-Bulletin on the New York Attorney General’s lawsuit against Spectrum-Time Warner Cable over internet speed claims. The College of Law will celebrate its annual Diversity Week, February 6th through 10th, with a variety of events and programs. Syracuse University College of Law has numerous faculty expert available for media interviews and spoken or written commentary and analysis for a variety of topical subjects. Please make your request by contacting Rob Conrad, director of communications and media relation at 315-443-9536 or rtconrad@law.syr.edu. For the Syracuse University newsroom, call (315) 443-3784 or visit SU News.